Doubtful, all Injectors where cleaned and flown 300 miles ago and no signs or smell of fuel in the engine bay. possible your injector scaling is off since you freshened them up? 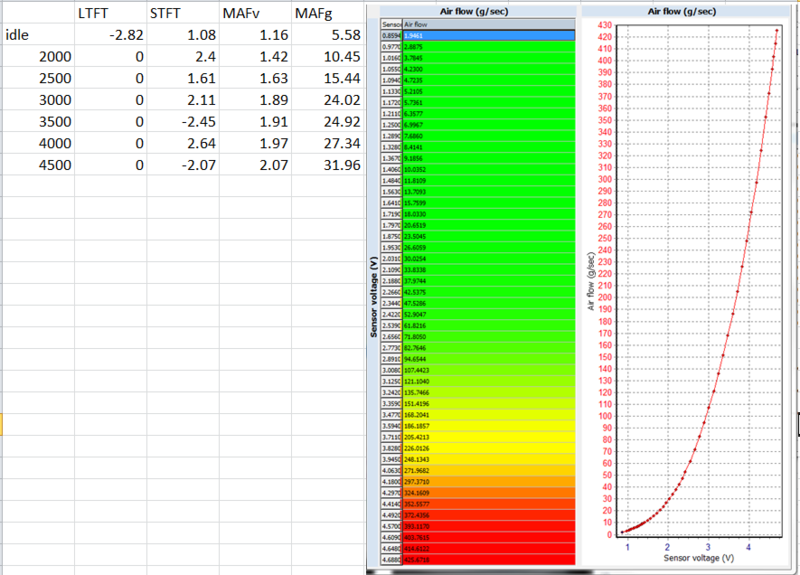 I know the scaling is off, but why would my STFT be 0 and my LTFT be -6? stft affects the ltft ... the pcm has learned over time to pull 6% of fuel from idle. STFT is used as an immediate compensation for variations in the environment. I'm almost 100% sure. The scaling on injectors in atr is flow at pressure. I think the whole reds are rated at 290 IS MM Bull ****. Red injectors are 330cc. And 369 IS the flow rate at 4 Bar. So if yours are flowing 400 at 58 PSI then they are flowing about 8% more then stock. How much have you adjusted your MAF by? 2% would be my guess then the other 6% is being taken care of by the LTFT. Last edited by logalinipoo; 06-19-2014 at 11:38 AM. Just a rough example Logan, I was simple stating they flow more than they normally do. I have to do the math but I follow the injector bank scaling procedure and just increase or decrease the size based of the % my trims are off and verify. Carbon, I figured it was a good thread to post that in. I haven't watched any of the videos, but If you know your injectors are off then I think you should fix them before you adjust your MAF scale. or Set them to correct then adjust the MAF to bring your LTFT into the right range. If you don't know for sure then adjusting based on MAF is a good thing. If the car isn't warmed up it'll be in open loop and that might account for your STFT being 0. It's a thought. I'm with logan. Scale your injectors before touching the maf. I love this thread. I've been looking for a place to discuss tuning ideas openly on this platform. So my bank 1 is 7.75% larger but my bank 2 and 3 are 11.76% smaller. Last time tuning I just did the logging and adjusting by the differential of fueling vs AFR Target and AFR Actual, would it be a better start this year to adjust my injectors by the change in flow rate before I do anything or follow the same procedure as usual but be aware they will change once i get to that step? If your MAF is flowing at 5-5.5 g/sec then change injectors; and vice versa. If they are flowtested and you want to change them ahead of time, I don't see why that would be a problem - I do that currently. Just be sure they were flow tested at 60PSI - lots of places only do it at 30 PSI. Last edited by Kane; 06-20-2014 at 08:20 AM. I learned a lot from Kane and went from knowing nothing about tuning to getting a foot in the water and a tune from him that worked. One of the hard parts from me though was really understanding, and i mean REALLY understanding exactly what happens when certain things are modified. So now that the weather is nice out, and the days are longer, i decided to go back to my stock tune, and put everything that I learned to the test. All that aside. dont be afraid to try things out when scaling. My fear is what really drove me away from learning, and honestly, it was amazing to look at some data and say 'oh ok, this is this, that is that, so i need to scale my maf/primaries by X%' and low and behold you see that math properly play out when you go to acquire a new set of logs. As long as you are changing things that you are unclear about ever so slightly, and capturing data, your risk of harming the engine are so low. Fun example was my CL band was trending about 5% rich (~-5stft across the board to 6k). Well i scaled the injector down instead of up (negative sign threw me off). What happened ? Turned on the car and now i saw ST's sitting at -10 ... awesome ... i just learned something.... did anything break? nope ... did i quickly realize what i did wrong? yup! don't be too worried about chasing down 0 LTFT as seasons change so does weather and temps and the LTFT will change to accommodate that. So this may sound pompous (and I apologize if it does), but is tuning really just about scaling your MAF, Injectors, dial in your AFR under WOT and timing? For some reason thought of it as some non understandable voodoo magic. Last edited by Carbon8; 06-20-2014 at 02:15 PM. You will change your attitude if you ever tune for boost. I am not saying I know exactly how to do the things I listed, specially talking full advantage of timing etc... just saying that those are the basic principals and issues that are focused on. knowing what to change is only opening the door, knowing how to change them and why is the separation point. it's pretty simple once you understand the concept and how all the parts work together. Timing is where I fail at life. This platform in particular is rather simple in the tuning dept. I also am N/A and haven't ran into any real problems. idle LTFT -2 under throttle it goes to -6 does LTFT change over the period of tuning or should it stay the same. worked with Kane getting the car where its at. and we were at 0 for LTFT, after things looked good and drove the car for a period of time the LTFT stay at -2 and WOT or load its -6.